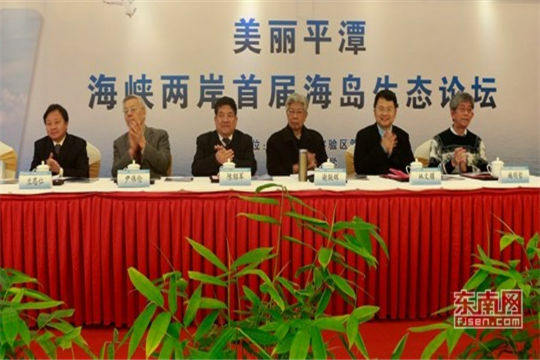 Chen made the remarks at a cross-Straits forum focused on island ecological development held in Pingtan in Southeast China's Fujian province on Dec 17. Pingtan, a remote island off the coast of Fujian, is the nearest part of the Chinese mainland to Taiwan. The forum, held for the first time, is among the local government's efforts to further academic communication and exchanges with Taiwan and an important echo of the central government' call to promote green development, which is characterized by intensified protection of ecosystems. More than 100 scholars and experts from universities and research institutes including Xiamen University, the Chinese Academy of Engineering, the Academia Sinica and National Chung Hsing University, took part in the event, discussing the topics involved in island development such as forestry, agriculture, health care and business startups. "As an island city, Pingtan has been on the fast lane of opening-up and development, and how to achieve sound ecological development is now of great significance to the city," said Chen. Taiwan and Pingtan could explore cooperation opportunities considering their similar geographic and climate conditions, he added.